Look at all those pretty colors! The freshness of these bowls is just amazing. 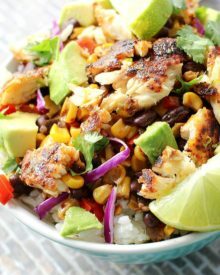 You can make fish taco bowls with any type of fish that you like, although I would recommend that it’s a white, flaky fish… tilapia, cod, etc. Living in Ohio, there’s not exactly a huge abundance of fresh seafood lol. And I think that’s been my problem… when I’d tried fish in the past, it was frozen and/or not very fresh, and just tasted… well, not good. 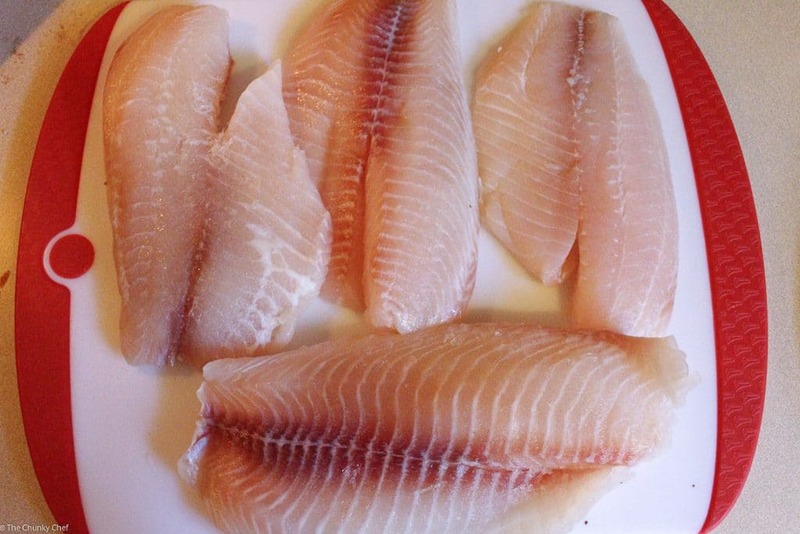 So this time, we picked up some fresh tilapia filets from the seafood counter. Ohhhh man, they were awesome! They didn’t smell, or taste, fishy at all. What you see in those photos are the main ingredients I chose for this recipe. Obviously the tilapia, then some roasted corn, black beans, and red peppers, and my fresh and light Cilantro Lime Rice. I cooked the fish by heating a large cast iron skillet to medium high heat, then adding a drizzle of olive oil and the minced garlic. I cooked the tilapia filets, 2 at a time (don’t want to overcrowd your pan or you won’t get that great crust). Once you place the filets in the pan, don’t move them. That will allow the fish to really sear and get that fantastic dark golden color. Cook them for about 2-3 minutes, then carefully flip the fish over and cook on the other side for another 2 minutes or so. You want the fish to be fully cooked, meaning all white, and flaky. Remove them to a plate and cook the second batch of fish, removing them to the plate when finished. 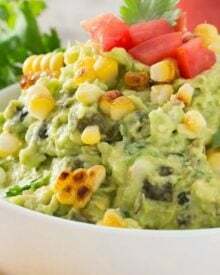 Now add your chopped red onion, diced red bell pepper and corn kernels to the pan, spread into an even layer and let them sit for 1-2 minutes. Don’t stir them right away, you want them to caramelize a little. Continue stirring then letting the veggies caramelize until they are roasted and caramelized. Add in your black beans and cook another minute. Remove to a bowl. You’re ready to serve! You can lay all your ingredients out like this, and grab bits from each section, or toss it all in a bowl and go to town… your choice 🙂 The toppings are also all up to you. I chose diced avocado (when do I not… I swear I’m addicted lol), shredded lettuce and purple cabbage, roughly chopped cilantro leaves and a splash of fresh lime juice. 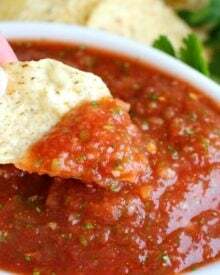 You could also add some sour cream, shredded cheese, salsa, tomatoes or pico de gallo. It’s your meal, so your choice 🙂 Ooooh, you know what would be great on this? My Honey Lime Cilantro Sauce or Avocado Cream Sauce! I love how simple this meal is to make, and customize. 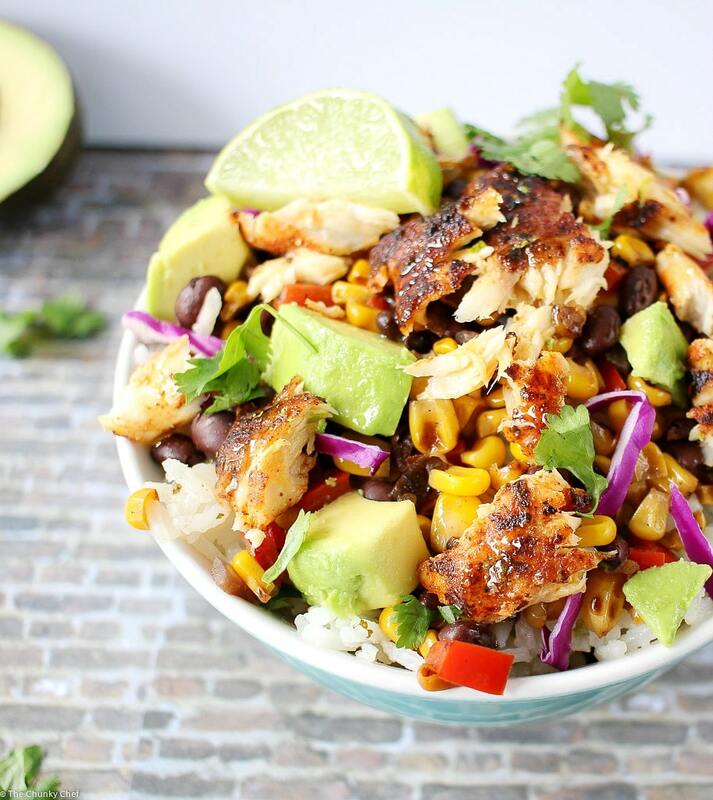 You could make it even healthier by serving it over brown rice instead of the cilantro lime 🙂 I just love the extra boost of flavor you get from the rice. Fish not your thing? The same spice mixture would be fantastic with thin cut chicken breast, shrimp, even pork. You could also take all the same ingredients, prepared the same way and add them to a corn or flour tortilla to make a killer fish taco! If you do this, please try my Homemade Flour Tortillas, the flavor is just incredible! Or you could toss the ingredients on a bed of romaine lettuce and have a salad. Don’t you just love having options? 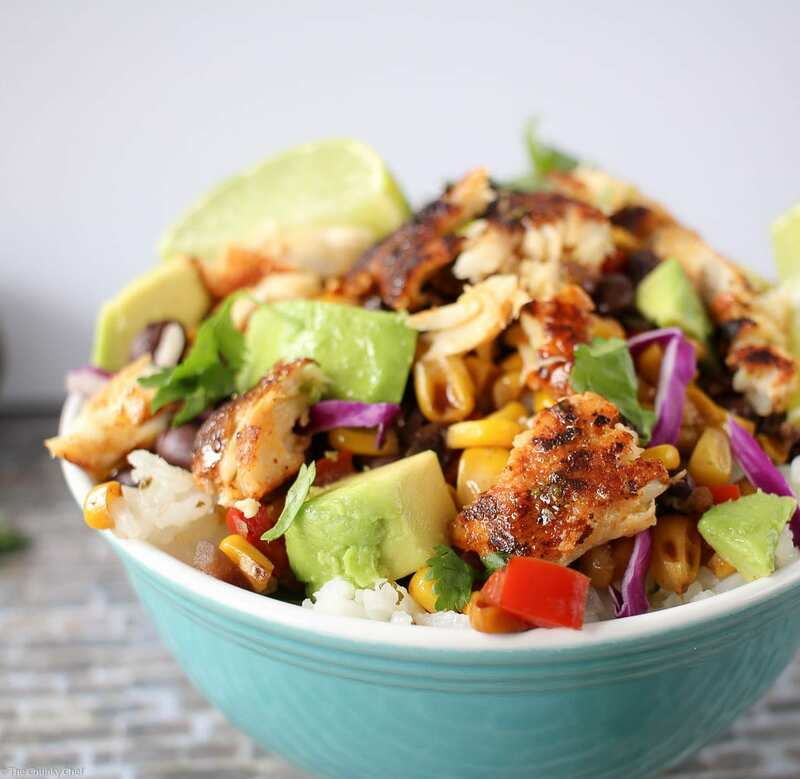 Taco bowls get a healthy twist with the addition of spicy blackened tilapia filets, garnished with buttery avocados and a splash of fresh lime juice! 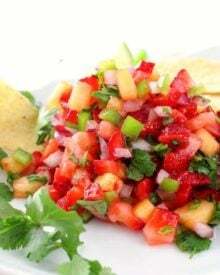 ** Additional toppings could include shredded cheese, sour cream, chopped tomatoes, salsa, or pico de gallo. ** Additional ways to serve would be laid out on a plate, mixed together in a bowl, in a soft taco, on a salad, or with shrimp, chicken or pork. I was looking for a fish dish and this looks amazing! I’m heading to the market now to pick up the ingredients! Im so excited!!! Hi Jerry 🙂 My calculator said 430. This is our third time making this delicious recipe!! Just love it. 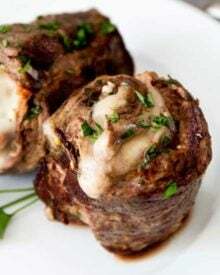 Delicious, easy, and done in under 30 min! We made the fish and put in a burrito with rice mix, sriracha mayo, and we couldn’t get enough! Will definitely make again! 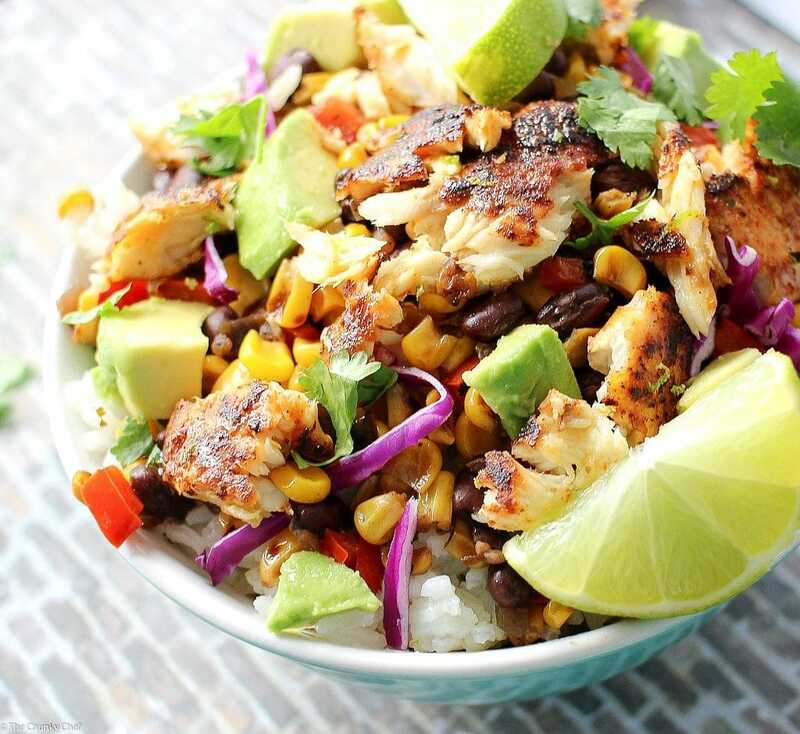 This dish is packed with fresh flavor! Even my pickiest eater loved it!!! Hi Amanda, its been a while and I wanted to stop by and check out some of your recipes. I knew I would find something good. My son always talks about fish tacos and I have always turned my nose up. But you make these look so good I would love to try them. I would love to have you stop by and share on the Friday Features Linky Party. Hi there Karren, I hope you’ve been well! I’ve certainly never been a fan of seafood, but these really hit the spot 🙂 I’ll definitely stop on over for the party! We did this for Sunday funday, and it was a huge hit with our adult kids. I did a cilantro lime vinaigrette to pour over… Fabulous! Thank you! Tamara, I am SO happy to hear you all loved it!! 🙂 Hearing things like that just make my day 🙂 Ooooh that cilantro lime vinaigrette sounds like a fabulous addition! LOVE the colors of your photos! I recently tried baking tilapia and it was way too watery for my taste. I’ll definitely have to try this the next time I make it! This looks awesome- I’m definitely pinning it. Would you mind if I link to this (I post text links to things I like each Friday)? Either way thanks for sharing. Love me some tilapia. And love this recipe. Looks so healthy and delicious. 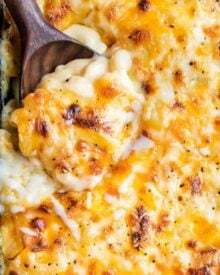 Found your recipe at the Simple Supper Tuesday Link Party. I am the hostesses of Tickle My Tastebuds and would love you to stop by and link your taco bowls. 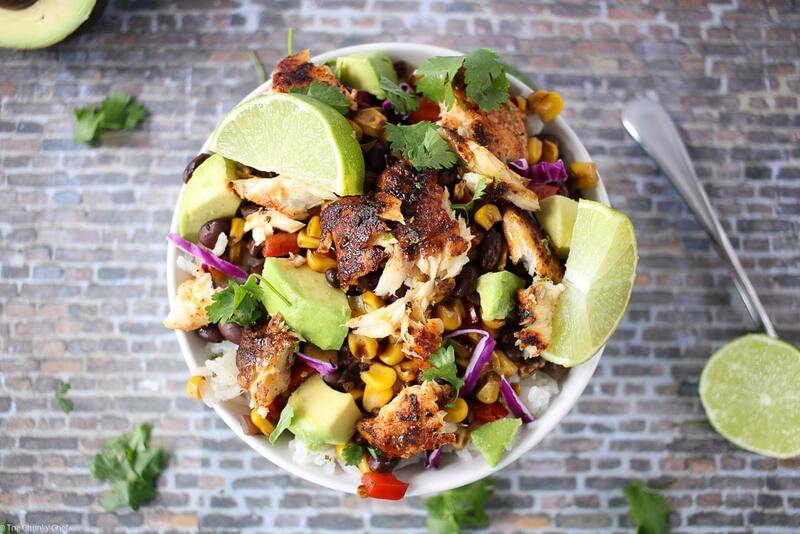 The blackened Tilapia Taco bowl looks sooo tempting! I love seafood, I love Taco bowls! You have got me here Amanda!!! I love how it makes eating healthy look delicious! Wow, this almost looks too good to eat. Your photography is amazing and this looks absolutely delicious. Thanks for sharing! 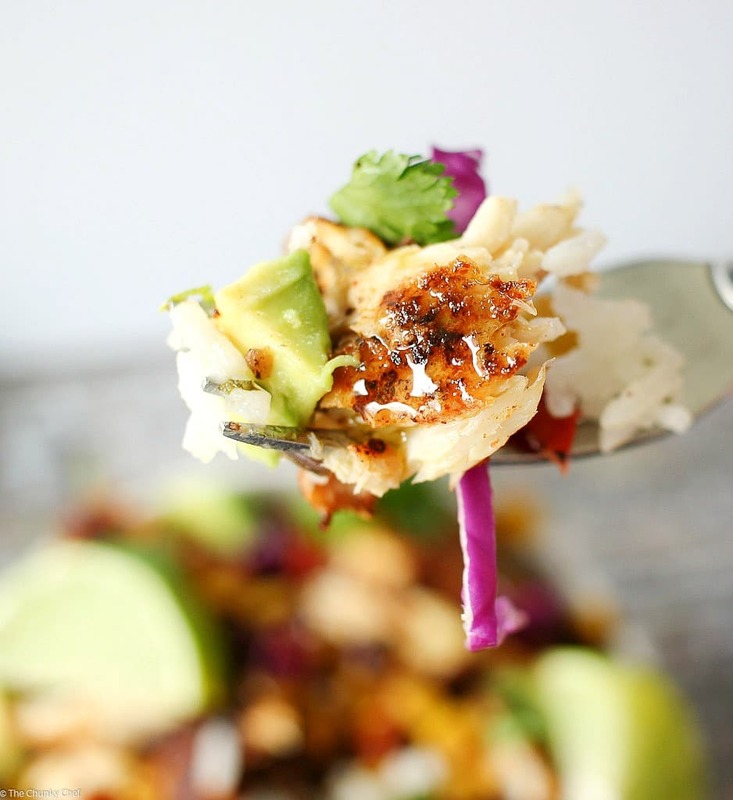 This dish looks full of flavor and easy to customize for any dietary restrictions! I can’t wait to give it a try! Thank you Sam!! 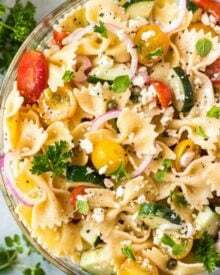 😀 I love customize-able recipes, for regular changes or like you said, for dietary restrictions 🙂 I hope you love this one! I’m not a big fan of seafood either, I don’t tend to venture much further than prawns but this looks like it could change my mind! 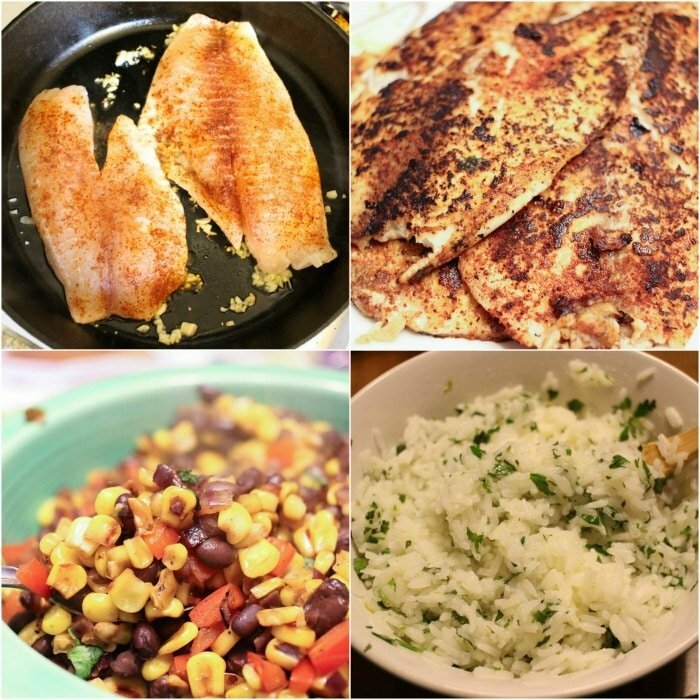 I’ve never tried tilapia and this looks so fresh and delicious I think I will have to give it a go! Your photography is stunning! I always aspire to make my food look this appetizing! (I love the recipe, too, by the way!) What camera do you use? I am in search of a new lens, at least, for my Pentax! Cheers! Your recipe looks delicious!!! I need to try fish tacos!! This will be a great feature this week Amanda, thank you! This is so up our alley! I can’t wait to try it! I was excited to see it at #FoodieFriDIY. Pinned and sharing too! 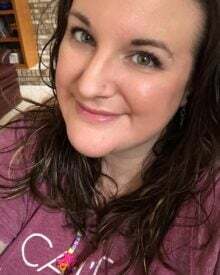 Hope you are having a wonderful weekend, Amanda! 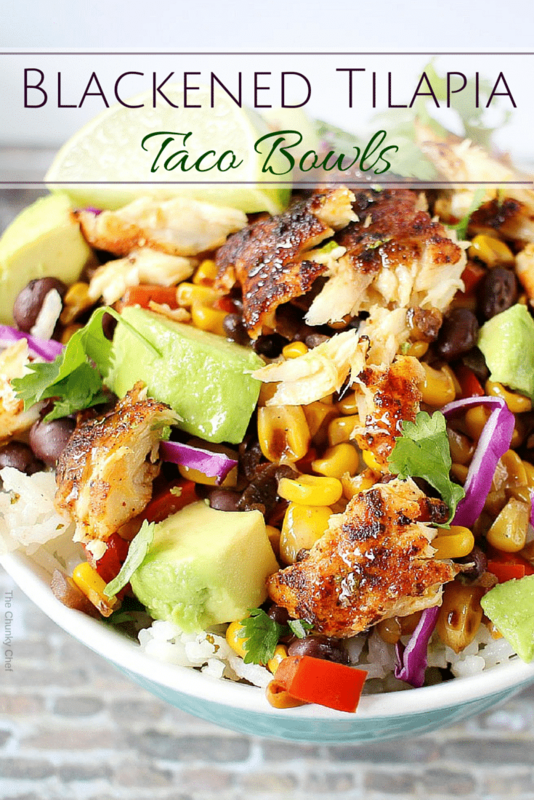 I love all things taco- including taco bowls 🙂 This looks so fresh & amazing. 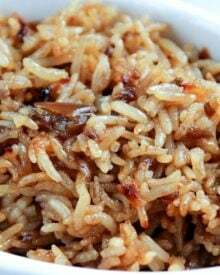 I love the cilantro lime rice – yum! This looks and sounds absolutely amazing and delicious and healthy too! All in one. Great pictures. 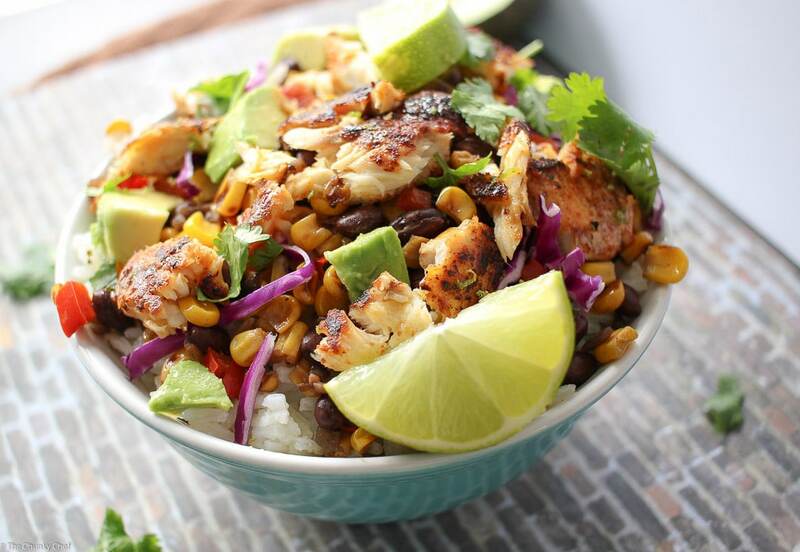 We will just love your Blackened Tilapia Taco Bowl! Your post is awesome and thanks so much for sharing with Full Plate Thursday. Ooh this looks awesome, looks so fresh and yummy! I LOVE seafood Amanda. And this is my ideal lunch. The chopped bits of fish in the dish have me drooling. Total yum.. I love the idea of having your whole meal in put together in such a fresh and vibrant bowl! It looks so appealing! Stunning to look at and I imagine delicious to eat! Lovely dish, Amanda! Thanks for stopping and sharing your recipes with us at Real Food Fridays. This looks and sounds delicious. Pinned & twitted. Thank you SO much Tracy!! 😀 It was so tasty, and will definitely be on the menu a lot this spring and summer. Happy FF!! Thank you so much Kaila!! 😀 It felt good to venture into new food territories 🙂 Happy FF and have a great weekend as well! That’s a super tacos! Love your photos! Visiting from the Pin Junkie! All ingredients I love…sounds perfect! Thanks for sharing with the Thursday Blog Hop! WHOA!!!!!!!!!!!!! These pictures are INSANE!!!!!!!!!!!!!!! I’m hungry now and I could have SWORN I was full when I got here…. I just stared a every pictures for way too long with my mouth wide open…. haha!!! Another one for my list!! 🙂 Mark would LOVE this, he loves fish and Mexican! Oh yummy! Simply delicious, Amanda. I can eat this for dinner all week. This looks delicious Amanda! I am feasting on all of these bright colors, textures and flavors!